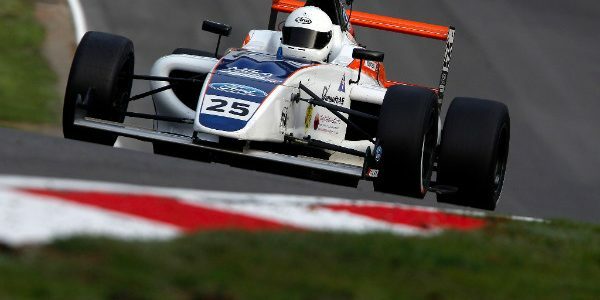 The Richardson Racing team endured a challenging weekend at Brands Hatch as the curtain came down on the inaugural MSA Formula season at the famous Kent circuit. The Grantham-based team headed south hoping for a solid end to its second season of single-seater competition, although lead driver Louise Richardson would be left to wonder what might have been after running into problems in two of the three races. Louise qualified 16th on the grid for the opening race of the weekend having been hampered by an overheating engine that prevented her from pushing for a quicker lap, although she battled her way forwards when the lights went out to cross the line just outside the top 10. Race two saw her finish in 13th spot, having lost time when she accidentally hit the kill switch on the car and briefly cut out the engine, before taking to the grid for the 30th and final race of the campaign. Running 15th at the end of the opening lap, Louise then found herself caught up in an incident with Ameya Vaidyanathan that saw her tipped into a spin; the resultant damage leading to her being forced to back off for the remainder of the race. Louise took the flag in 17th spot and ends the year 16th in the championship standings; albeit little more than 30 points away from the top 10. “Well I went out with a bit of a bang in race three, but it wasn’t the kind of bang I was hoping for!” she said. “In truth, it’s been a difficult weekend where we didn’t quite have the pace to challenge for the results we hoped for, but that is the nature of motorsport and things don’t always go your way. The opening race went okay and eleventh wasn’t a bad start to the weekend but in race two, I have to hold my hands up and admit it was my mistake that caused the car to cut out and it cost me some time. “In race three, I was side-by-side with Vaidyanathan into Druids and he ran wide out of my vision and I thought he’d gone off. As I moved across, he suddenly reappeared next to me and next thing I knew, my car was in the air and I was going backwards down the hill towards Graham Hill Bend. From then on, there was a vibration with the car and I just backed off to make sure I brought it to the finish. Team-mate Greg Holloway meanwhile brought the curtain down on his three event programme with three more trouble-free finishes; the best result being 13th place in the opening race of the weekend.